In 1997 as the cigar boom began to wane, La Flor Dominicana blessed us with a funky little figurado called El Jocko. There were relatively few decent cigars to be found at that time —the few reputable manufacturers were struggling to keep up with demand and maintain quality amid severe tobacco shortages, while some retailers were limiting purchases of standards like Fuente 858s. El Jocko was exactly what seasoned smokers needed — a full flavored and consistent cigar with a strange shape that would confuse and repel the amateurs. 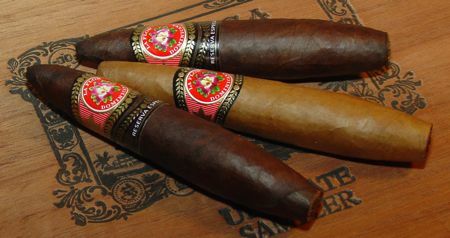 El Jocko comes in two styles: an Ecuadorian Connecticut, and a Mexican maduro. At one time there were two sizes as well, but it appears that now there is only one, which measures 4 1/2 inches long and has a 54 ring gauge at it’s thickest point. (The other size was a larger version of this one.) The binder is Nicaraguan, and the filler is Dominican piloto cubano. The Connecticut and Maduro versions of this cigar have similar construction values. This shape is challenging and would seem to invite construction defects, but for the most part it avoids these. I smoked two of each for this review, and they all drew very well and burned with a slow determination. Minor burn problems had me reaching for the lighter a couple times, but the corrections I made were not entirely necessary. Both species start out a tad harsh, but in different ways: the Connecticut is noticeably tannic, while the Maduro bursts with peppercorn. In both blends this dies away as the ring gauge expands. The Connecticut is typical of medium to full-bodied Dominicans — the piloto gives it a respectably spicy spine, while the wrapper imparts a softer touch: nuts, and a sweet clover honey-like fragrance. As the bulbous section burns to a solid light gray ash the pepper returns, and the flavors grow more aggressive. Smoking slowly is highly recommended at this point to avoid overheating. The flavors remind me a little of the 601 Connecticut, but considerably toned down. The Maduro displays a little more character. It comes out of the gate with a dose of black pepper and can initially be a bit harsh on the throat. It mellows after the first half-inch or so and the smoke takes on a creamier texture. The first section tastes of burnt coffee or bitter chocolate. As the cinder burns through the waist of the stick it gradually becomes sweeter and develops a leathery aspect. It’s slow burning with a lengthy finish and leaves an aftertaste of char. Into the final stretch the flavors turn darker and sharper once again, reminding me of La Flor Dominicana’s popular Double Ligero series. Again, not as bold as the DL, but similar in taste. Unfortunately, it’s not a taste I really enjoy. The middle section was quite nice — smooth and flavorful without the carbonized sugar taste that I didn’t care for in the last third. These are both very good cigars, but when compared with the incredible array of fantastic smokes available right now, they pale a little bit. My memory of El Jocko is that it was much better ten years ago than it is now, but taste must be taken in context and memories fade. Trying to compare today’s cigar to a ten year old memory is probably no more than an interesting experiment. It’s a much better world for cigars now, and ten years of tasting many different blends has honed my palate a little… for the better I hope. El Jockos sell for around $5 to $6 individually, or around $100 a box. That seems reasonable to me, especially considering the craftsmanship required to make this unique looking cigar. It may seem a bit much for such a small cigar, but take it slow and this little perfecto will spin an interesting yarn for up to 45 minutes. Good read! Have you ever considered authoring a book? I’m sure it would be a best seller among cigar enthusiasts. For some reason (probably DPG) I have not sampled many La Flor Dominicana. From your review it sounds as if I may have to try these. Good price and, especially the Maduro, sounds like my cup of tea. If only I wasn’t anticipating an overflow of Padron’s I would go out and get some today. Thanks for yet another great review. Lucky7 — I think you would enjoy the maduro as well, at least as a morning or mid-day smoke. LFD is making so many excellent cigars now that this one seems to have fallen by the wayside.